Check The News & Observer’s write up and video on our Blue Dogwood Public Market location where we not only have our delicious fresh cuts and charcuterie that you’re all familiar but sandwiches and meat plates too. Our sandwich menu is always changing and challenging your pallet. Recently we were featured in the premier episode of tasteMAKERS on PBS! We had a great time with Cat Neville talking about whole-animal butchery, sustainable agriculture and of course, our delicious meats! Click below to see the entire episode! 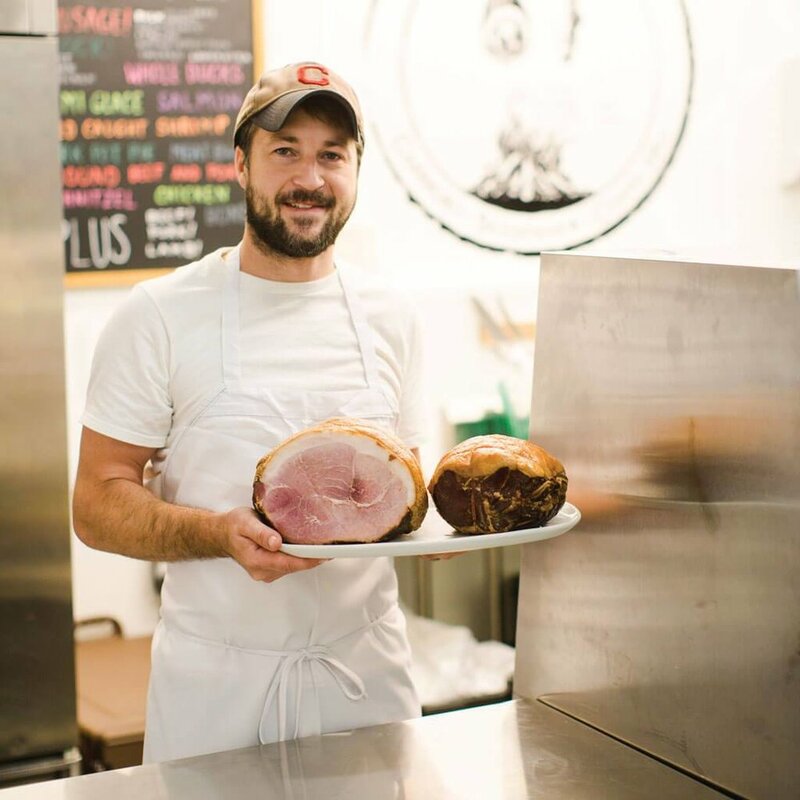 Cane Creek Farms and Braeburn Farm in the tiny North Carolina town of Saxapahaw sustainably raise heritage pork and grass-fed beef, which is sourced to Left Bank Butchery. Check out our sit down with Our State Magazine’s Emily Wallace as we talk “glam hams”! Left Bank Butchery on Netflix!! And with Michael Pollan too ( (Omnivore’s Dilemma, The Botany of Desire, and many more excellent books)!! That’s right! It was a true honor to be apart of this series along with Cane Creek Farm. For those of you who have a Netflix, we’re on the very first episode titled “Fire”. What is A Food Hall? The Food Halls Are Coming! But What Makes Them Different From Food Courts? Visit North Carolina - The Official Travel Website for NC stopped by to showcase the shop. See us in action below! Braeburn Farm is truly revolutionary. With progressive pasture and livestock management, Braeburn is a model for sustainable agriculture and carbon sequestration. Michaela OBrien chats with Ross about being and we quote, “The Butcher, The Baker, The Badass”. The Times-News of Burlington talks about Alamance County and the rejuvenation of once lost mills. Please call the shop at 336.525.2092 or stop-in to to discuss any needs that may not be listed above. We're here to help!